Leah Romero is a third year college student at NMSU pursuing a degree in Journalism and Mass Communication and a minor degree in Music. She was born and raised in Las Cruces and graduated from Centennial High School in 2016. She joined the Round Up halfway through the 2018 spring semester as a staff writer. This will be her first full year on the staff as a feature writer. Her experience also includes working with the White Sands Missile Range Public Affairs Office for a summer where her coverage included multiple Change of Command ceremonies and a Nobel Peace Prize commissioned photographer’s visit to Trinity Site. Her work has been featured in the White Sands Missile Ranger and both the Las Cruces Sun-News and Las Cruces Bulletin. 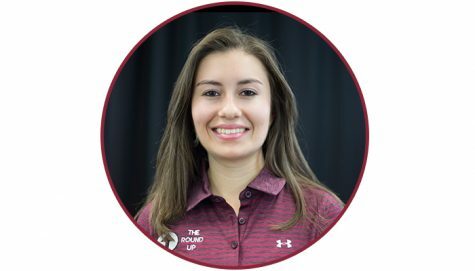 Outside the Round Up, Leah holds leadership roles with the NMSU College Democrats and the National Society of Collegiate Scholars. She enjoys playing the flute in campus ensembles and also baking and rollerblading in her free time. She is looking forward to another exciting year at NMSU and the Round Up. Her goals this year are to report on important stories impacting the university while also challenging herself to grow as a writer and reporter.